Tall and lanky stuntman/actor Boyd Stockman is another one of those faces we all saw hundreds of times during our trips to local movie houses and in front of our TV sets. Born in Redrock, NM, Stockman moved to California in the early ‘40s where he and his brother worked at the Bakersfield Land and Cattle Company. A cowboy all his life, after being spotted roping at the L.A. Coliseum Rodeo by stuntmen Joe Yrigoyen and Andy Jauregui, they suggested he try his hand in movies. 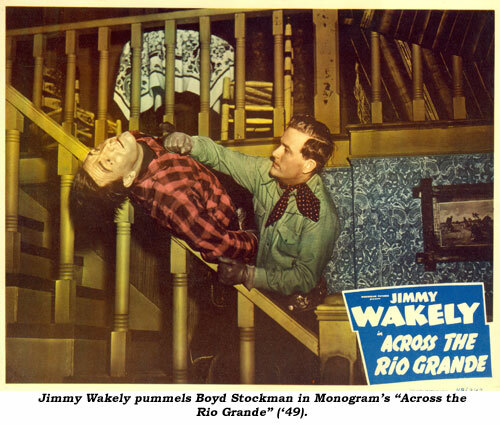 Stockman began doing stunts at Monogram in ‘45 (often doubling Jimmy Wakely and Johnny Mack Brown) as well as playing henchmen in the Wakely, Brown, and later, Whip Wilson B’s. Besides his expertise in roping, Boyd was an excellent horseman and team driver, often spotted as a stagecoach driver with dialogue. 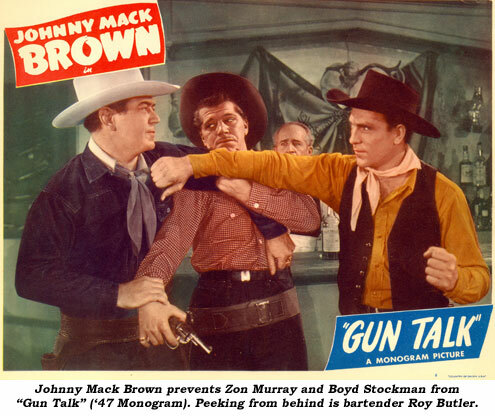 By ‘48, Boyd became a “regular” in Gene Autry’s Columbia westerns, performing both stunts and playing small roles in “Loaded Pistols”, “Rim of the Canyon”, “Riders In the Sky”, “Cow Town” and several others. During the course of Gene’s TV series, Stockman often doubled Gene himself, along with Sandy Sanders and Bob Woodward. Gene appreciated Boyd’s talents so much that he also used him on the Flying A produced “Range Rider”. 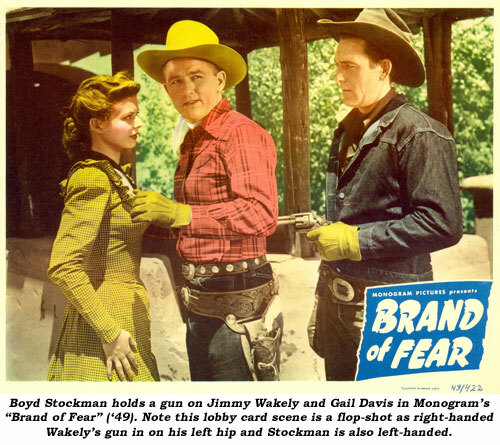 Meantime, Stockman found stunt work plentiful on other series, “Kit Carson”, “Wild Bill Hickok”, “Sky King”, “Tales of the Texas Rangers”, “Tales of Wells Fargo”, “Virginian”, “Cimarron City”, “Laramie”, “Gray Ghost” and others. 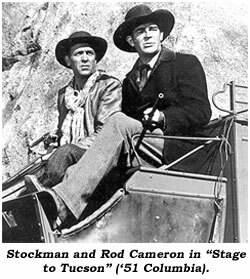 Stockman can also be spotted in “Badman’s Territory”, “Stage to Tucson”, “Stampede” (a terrific fight with Rod Cameron), “Al Jennings of Oklahoma”, “Column South”, “Ten Wanted Men”, “Night Passage”, “Apache Warrior”, “Frontier Gun”, “Ride Lonesome”, “Lone Texan” and “Five Guns to Tombstone” among others. A little known fact about Stockman is that he had only one good eye. A cow had switched its tail in his eye when he was young causing the eye to go bad. However, this did not hinder Boyd in doing the fist fights and rugged stunts he was hired to do. In the mid ‘70s Stockman returned to his native state of New Mexico where he died in Silver City at 82 on March 10, 1998. So many stuntmen of Stockman’s era went almost totally unheralded, but that was fine with them. They came, they performed, they got the job done they were hired for, providing us many thrills on which to look back.